Saint Vincent College, La Trobe, PA.
"It's mystical. When people see it...it's like Mother Teresa is right in front of them." The Studio is pleased to have many of the sculptures at The Mother Teresa Project established by Ave Maria University, Florida. 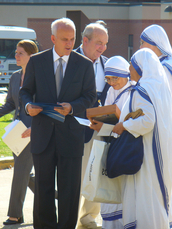 Open to the public, the center is a place to integrate and study the work/life vocation of Mother Teresa. Produced with permission of the Missionaries of Charity. Sculpture Copyright of Julie London, 1997 • Produced by Merna Chance • All rights reserved.